Every Monday from 9:00 am to Tuesday 22:00 pm, the door to the New World will be open! All generals can enter the new world during this period. 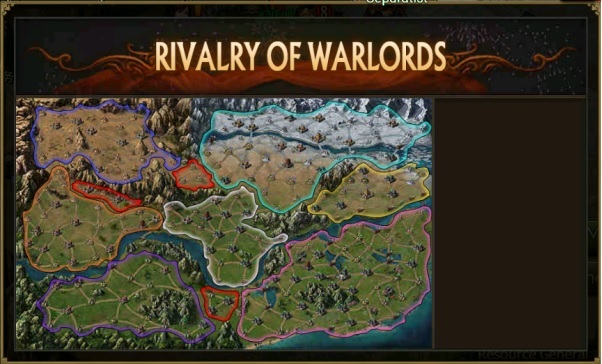 In the rivalry of warlord, there are many forces, destroy them from the new world! 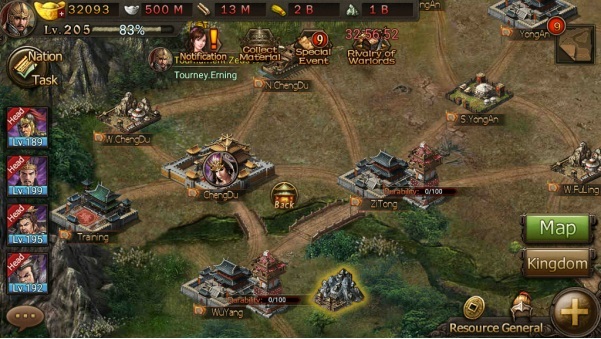 • After "Rivalry of Warlord" is started at 9:00 every Monday, click on the "War" button or the “World” button to enter the new map. • There are 3 respawn points in the map, and 3 countries randomly assign a respawn point. • There are many NPC forces in the rivalry of warlords, The country that takes the lead in defeating the NPC faction's main city is considered to have defeated the faction. • Players can also directly attack the main city of the enemy state, the enemy state will be destroyed after the attack of the main city, and will exit the rivalry of warlords. • Destroy any country, Can inherit NPC forces that the country defeated. • The settlement will take place at 22 o 'clock on Tuesday, and a reward will be awarded according to the number of NPC forces defeated. Defeat all NPC forces and destroy 2 other countries before settlement, return to the previous world earlier, will get a lot of rewards. 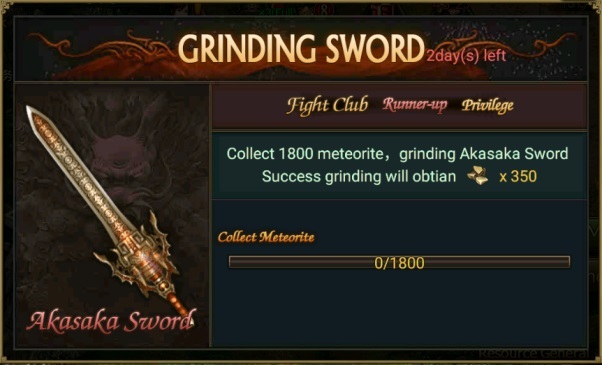 The top 16 in Arena will open the Casting Swords mission according to the rankings. After the mission is completed you’ll get a rewards. • Divided into 3 modes: Adv Hosting, Normal Hosting, Auto. • Normal Hosting：Players need to spend 5 gold，Automatically help players to consume the silk bag to choose the most profitable way to run a round of Silk Road. When the player runs out of silk bag or only has the option of gold coin, it will automatically pause and wait for the player to select it and continue the round of silk road again. win reward 4.2m exp...ngak masuk akal .event tiap minggu ini mohon di perbaiki rewardnya bisa di jelasin kenapa event susah gini reward 4.2m exp ? Malam ini 28 Jan 19... task Yan Wu, free battlenya error. Dibelain nyari 5 id buat genapin tp ngga bisa masuk le free battlenya. Pas masuk malah blackout... layar gelap... harus restart game. Awaken ZT jg ngga jadi2 padahal tiap hari minum wine... semua ritual yg ada uda dilakukan. Jd ngenes bgt mainnya. Tolong diperhatikan Min. Aar S2. Hapus aja Rivalry ini, bikin malas main aja. Resource habis, menang reward ga sebanding.Bikin kek yg berkelas, drpd rivalry ini. Rivalry Of Warlords, kena bug atau ada keperpihakan salah satu negara, sdh 4 minggu posisi negara WU tetap, sedangkan Shu dan Wei tukar tempat. Usul posisi 3 negara harus berjauhan , utk mencapai Tolong admin jelaskan masalah ini.